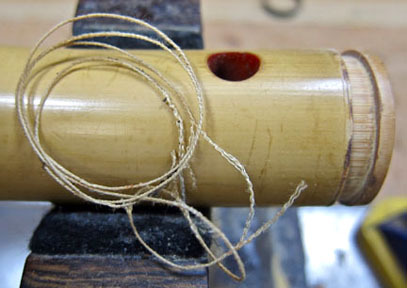 "Dear Mr. Levenson, I have two instruments which belonged to my father, Kurahiko, who passed away in 1995. 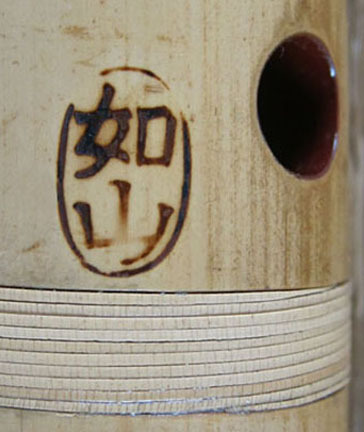 One is a classical 1.8' shakuhachi inscribed with the hanko of Miyagawa Nyozan. The other is a rokusun (1.6") made by Seikado / Kitahara Kozan I. I have kept both of these precious family treasures out of sentiment, but now believe they should be moved along to others who can enjoy their use and preserve their spirit into the future. 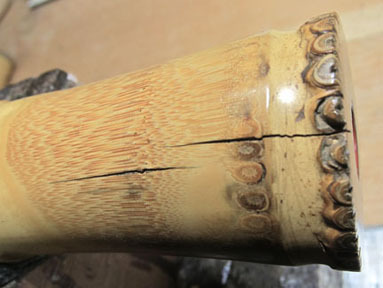 It is my hope that you can restore these instruments and bring them back to life. "My dad was born in 1906 in Japan, and came to California when he was 16 years old to join his father and two older brothers working to earn money to take back to Japan. He did not return to Japan when his father went back. 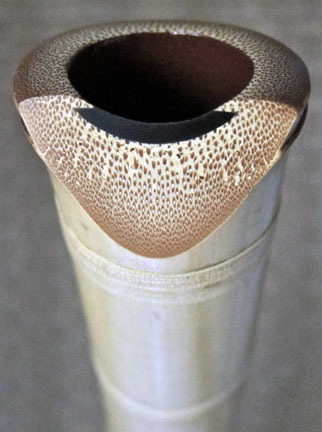 In his young adult bachelor years in Los Angeles, my father studied and played the shakuhachi. After the start of WWII, the family (two children, including me) was relocated by the US government to an internment camp in Roher, Arkansas. Upon release after the war, the family returned to the central valley of California. In my elementary school years, I remember his playing the shakuhachi. 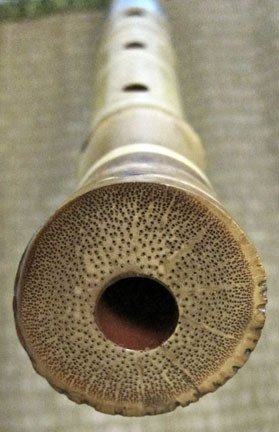 From this I assume he was either allowed to take the shakuhachi with him to Arkansas, or they were kept in safekeeping and returned to him after the war by his client friends in Los Angeles. 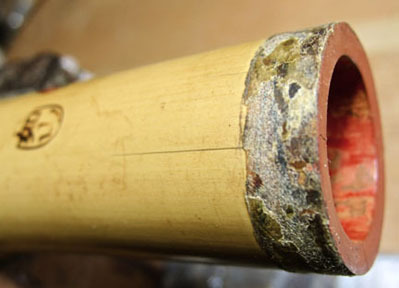 I am thus assuming these shakuhachi were purchased by him between the years 1926 and 1934." 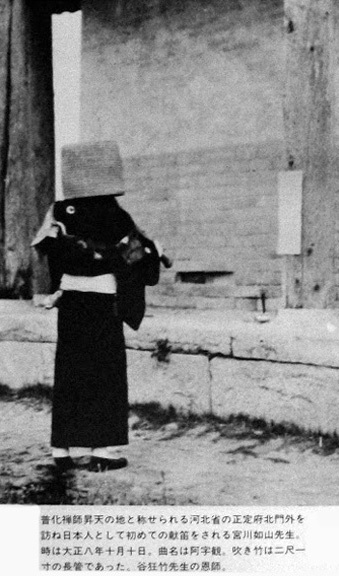 Miyagawa Nyozan offering Ajikan on a 2.1' at the North Gate of Hebei Zhengding in China where Fuke Zenji, the founder of the Fuke sect is known to have passed away. This photo is dated October 21, 1921. Nyozan lineage is the Kogetsu-in school located in Kumamoto. 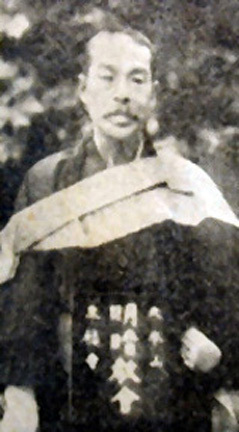 Miyagawa Nyozan was a 35th generation Meian-ry komuso from the Itcho-ken temple. He is best known as the composer of the revered honkyoku, Ajikan 阿字観. 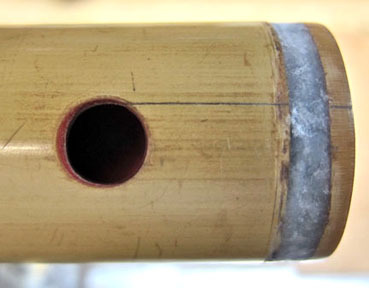 This composition, one of the most famous in the entire shakuhachi repertory, is played by nearly everyone who performs traditional honkyoku. 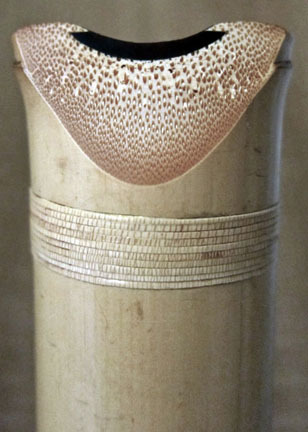 The title refers to an important meditative practice of Shingon-sect esoteric Buddhism. 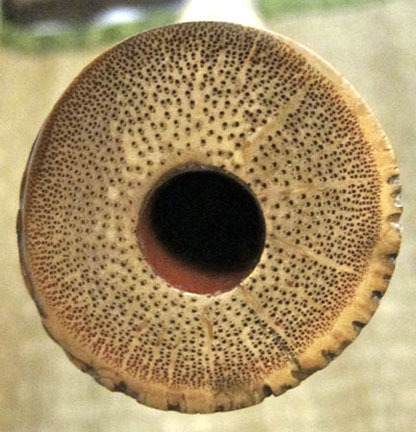 "Ah” is thought to be the first sound in Sanskirt, uttered by humans once they open their mouths. Once one has moved away from this "A" nothing is explicable in words, thus becoming pure "nothingness" or "ungraspable void." 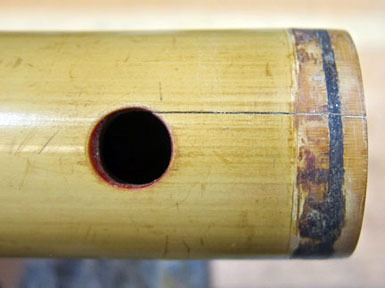 This 1.8' Nyozan was received in an unplayable condition with cracks in the bamboo, nakasuké, interior bore and root end of the instrument. 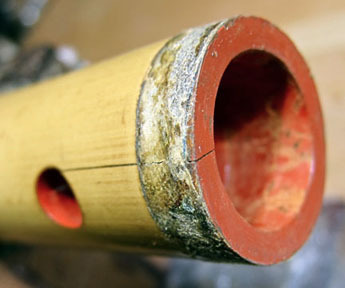 Pictured are stages in repair of the nakasuké. 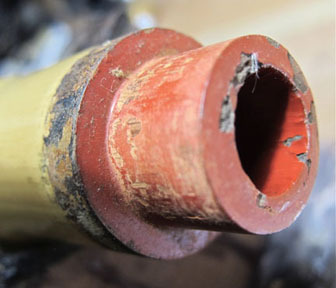 Rotted binding designed to reinforce the mortise of the middle joint caused it to expand beyond tolerenace and crack. 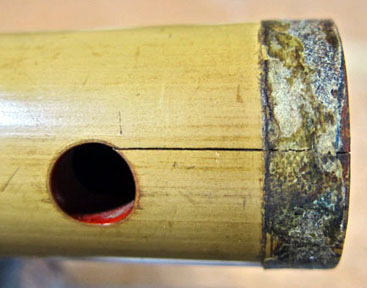 Air leaking through the damaged joint prevented the shakuhachi from playing properly. 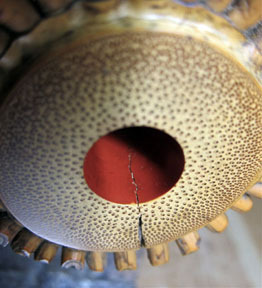 The old binding was removed and replaced, and the crack stabilized to prevent further damage. 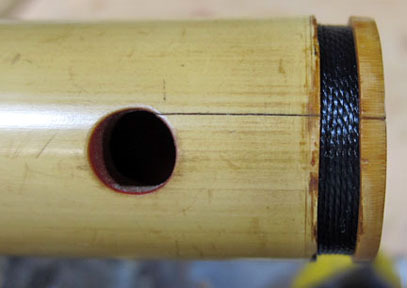 The completely restored 1.8' Nyozan included a performance upgrade, relacquered bore, rebuilt nakasuké joint, and inlaid rattan binding to protect the bamboo from further deterioration. It now plays at a very high level.